The Anglo-Saxon Chronicle provides an almost continuous narrative of the events leading up to and including 1066, one of the most well known years in English history. This narrative is enhanced by Norse, Norman, and Latin sources, and above all, by the magnificent Bayeux Tapestry. We shall begin with the fall of Cnut’s Anglo-Scandinavian empire and the restoration of the house of Wessex to the kingdom of England in 1042 with the return of King Edward (the ‘Confessor’), the son of Æthelræd Unræd and the Norman lady Emma. We shall then explore the rather complicated genealogical background to the ensuing succession crisis of 1066. 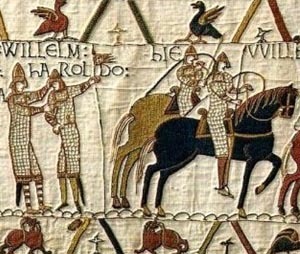 We shall consider the claims of the Norman, Anglo-Danish, English, and Norse contenders and chart the dramatic events of 1066 and its three great battles – Fulford Gate, Stamford Bridge, and Hastings – and the eventual Norman triumph. Sam Newton was awarded his Ph.D in 1991 and published his first book, The Origins of Beowulf and the pre-Viking Kingdom of East Anglia, in 1993. Since then he has been researching, lecturing, and writing as an independent scholar in Early Medieval Studies. His latest book, The Reckoning of King Rædwald, was published in 2003. He is also now a Director of Wuffing Education, NADFAS lecturer, and Time Team historian. Allen Brown, R., The Normans and the Norman Conquest (London 1969). Allen Brown, R., The Normans (Woodbridge 1984). Barlow, F., Edward the Confessor (Yale 1997). Barlow, F., The Godwins (Perarson Longman 2002). Higham, N., The Death of Anglo-Saxon England (Stroud 1997). Magnusson, Magnus, & Hermann Pálsson, King Harald's Saga (Penguin Classics 1966). Muntz, H., The Golden Warrior: the story of Harold and William (Chatto & Windus 1950). Swanton, M.(ed. ), The Anglo-Saxon Chronicle (Dent 1996; Phoenix 2000).